Amazing Lemonade Recipes To Thirst For! 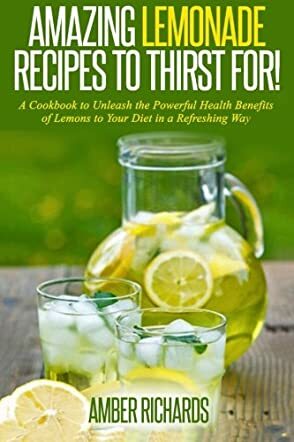 is a great little collection of recipes for lemon drinks, coupled with an informative section on the benefits of lemons in the human diet. The short informative section at the beginning was interesting. It reinforced some things that I already knew, like hot lemon drinks being good for fighting colds, sore throats, and other bacterial infections. It also pointed out some relatively unfamiliar benefits of lemon. For example, it's good for the skin and it might help in weight loss. It's also good for cholesterol, reducing high blood pressure and it has a calming effect. This is beginning to sound like a miracle food. The only real deterrent is that lemons have a powerful bitter taste and require something else, preferably something sweet to make it more palatable. This, the sweetening, in itself is a deterrent since so many people are avoiding excessive amounts of cane sugar. However, author Amber Richards has taken that into consideration and included several lemon drinks sweetened with alternative sweeteners like maple syrup/sugar and agave syrup. Amber Richards, mother of two, grandmother of four, is a very creative individual with several books to her credit. She writes children's books, but is more interested in writing about home and family topics, especially food. Her previous food-related e-book, Dairy-Free and Gluten-Free Foods, also showed a passion for presenting healthy eating alternatives. This book is a delight for anyone who likes lemons, but it's also beneficial for those looking for alternative healthy food sources. Well done!